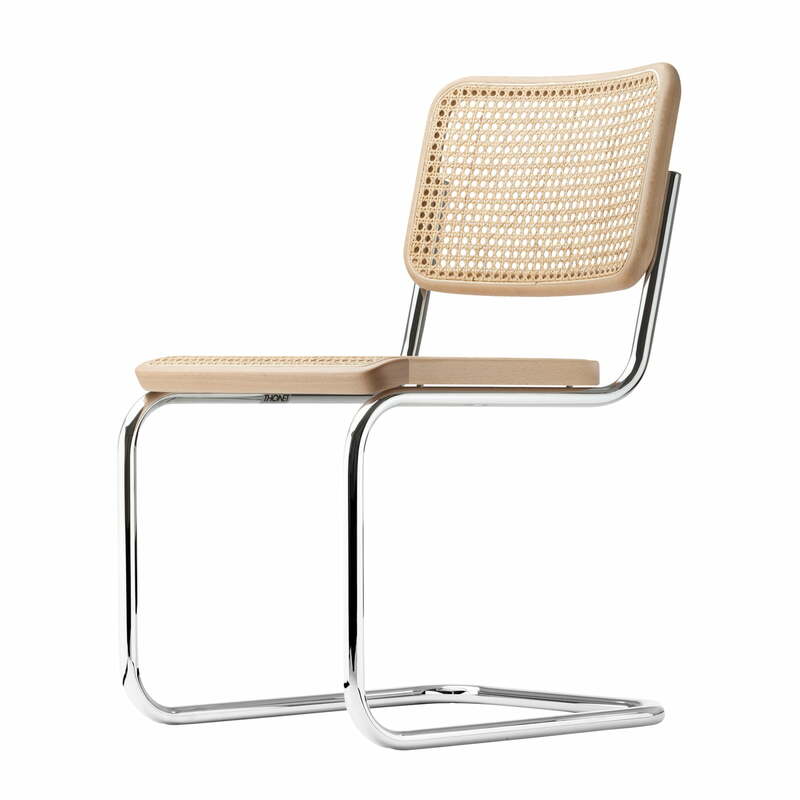 Thonet - S 32 V Chair, chrome / black stained beech (TP 17) / wickerwork with supporting synthetic mesh. 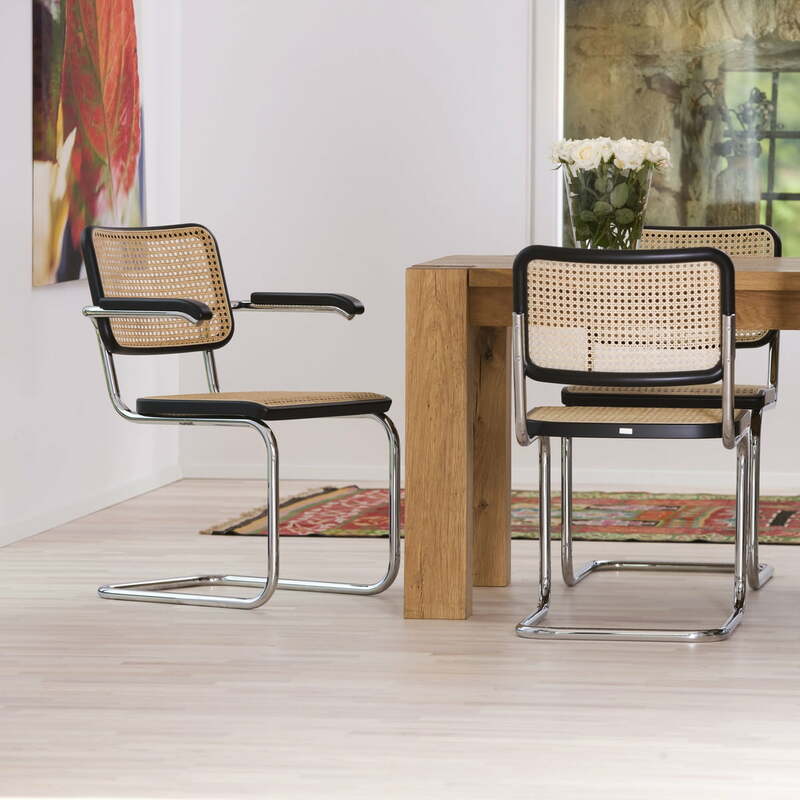 Thonet - S 32 V Chair, chrome / black stained beech (TP 29) / wickerwork with supporting synthetic mesh. 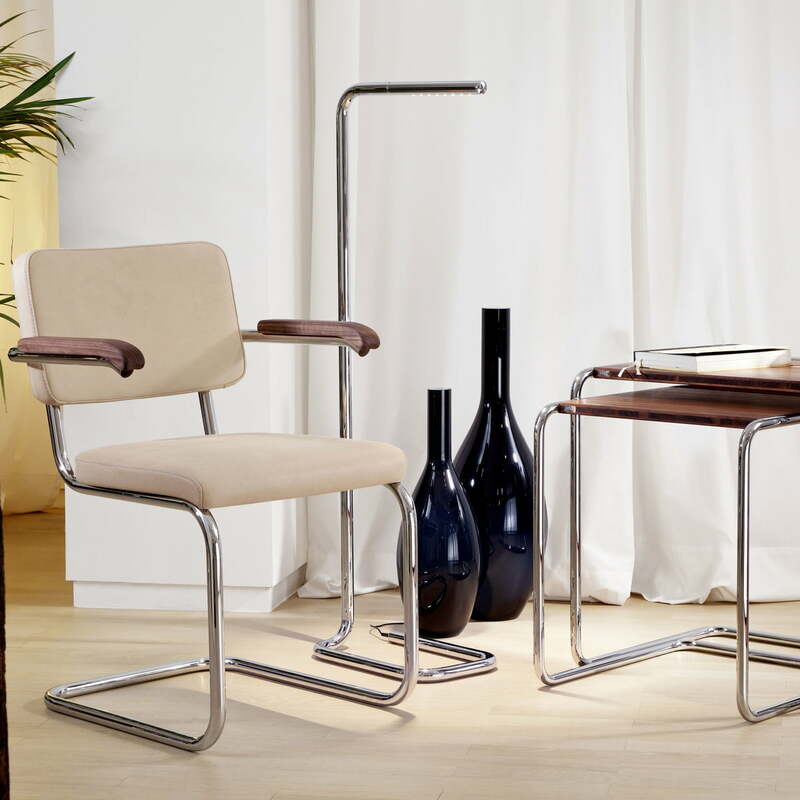 The S 32 chair is a design by Marcel Breuer from the 30s. The cantilever is a classic, influenced by the Bauhaus movement and one of the first tubular steel furniture of the 20th century. 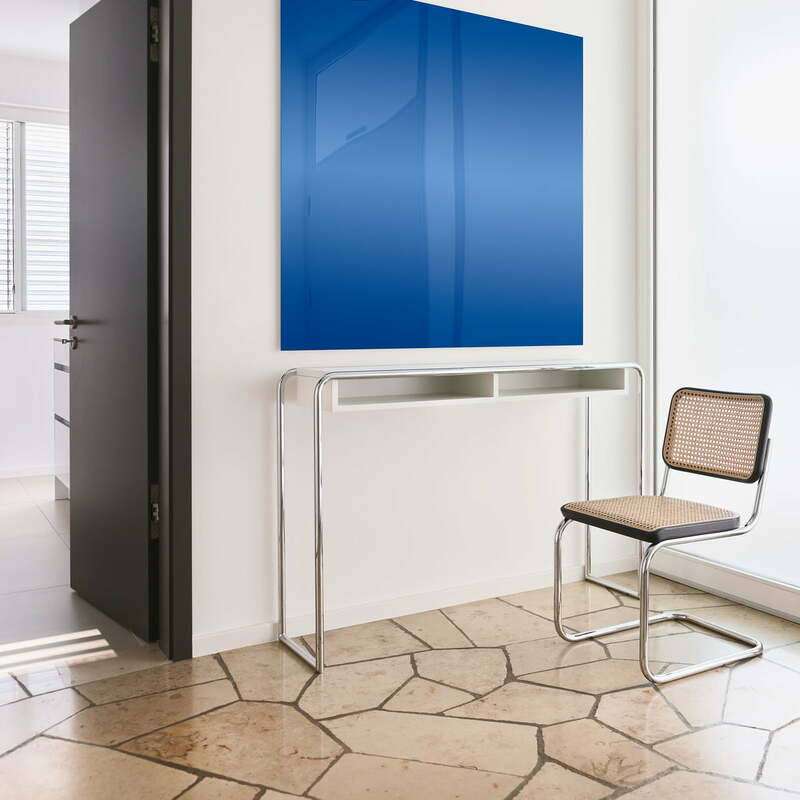 Thanks to its thanks to its aesthetic minimalism, the S32 is easily integrated into public and private spaces such as conference rooms, waiting areas, restaurants, dining rooms or offices. 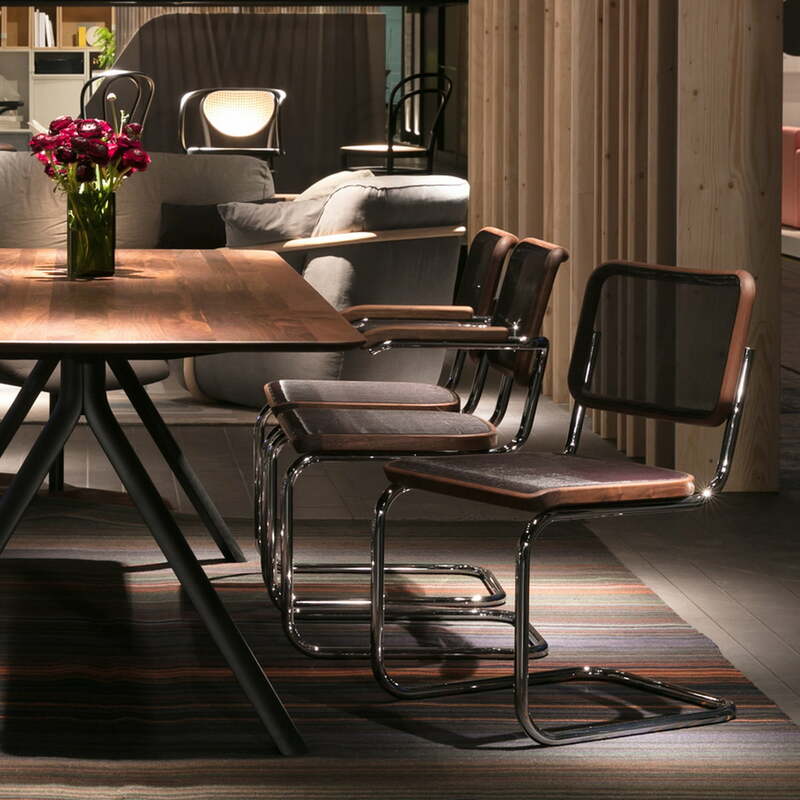 The tubular steel frame is available with a chrome-plated or lacquered finish while the wooden parts exist in stained beech or oiled walnut. 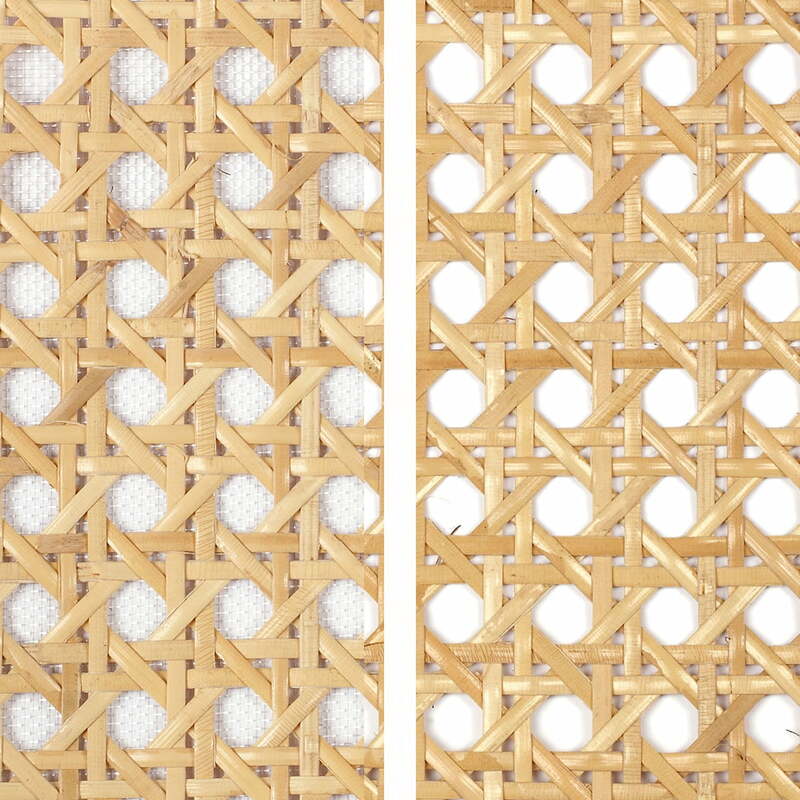 The fabric with wickerwork in various colours is optionally supported by a plastic mesh, which provides stability. 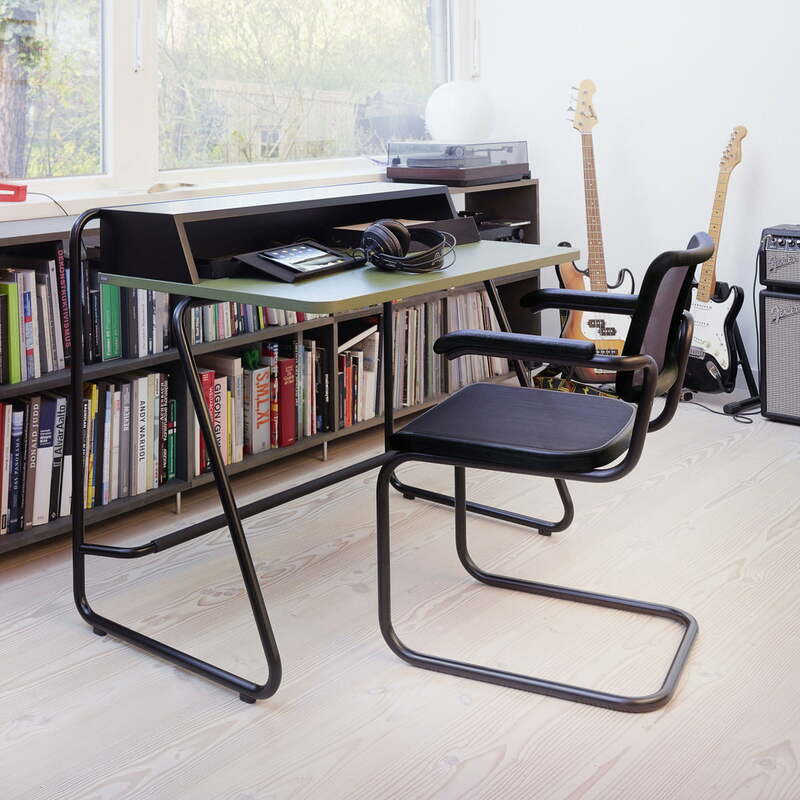 The Thonet cantilever chair is available in other versions, including one with armrests under the model number S 64. 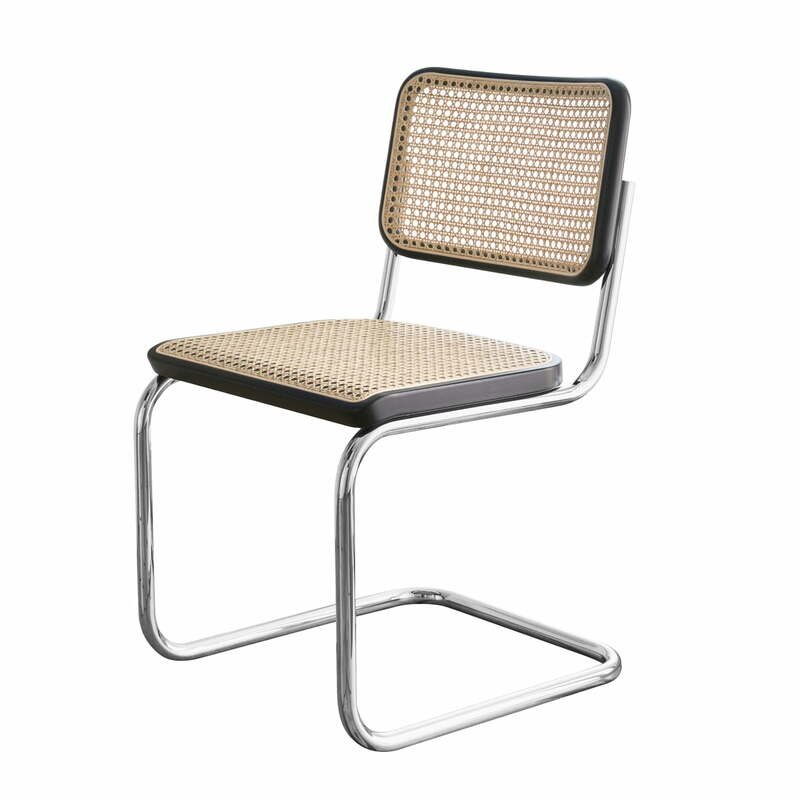 The S 32 Chair by Marcel Breuer for Thonet consists of a chromed steel a frame out of natural beach (TP 17) lined with canework for the seat and backrest. Lifestyle product image: Thanks to the touch sensor, the lamp is easily switch on and off, dimmed and remembers the last setting thanks to the memory function. Lifestyle product image of the S 1200 secretary desk by Thonet. 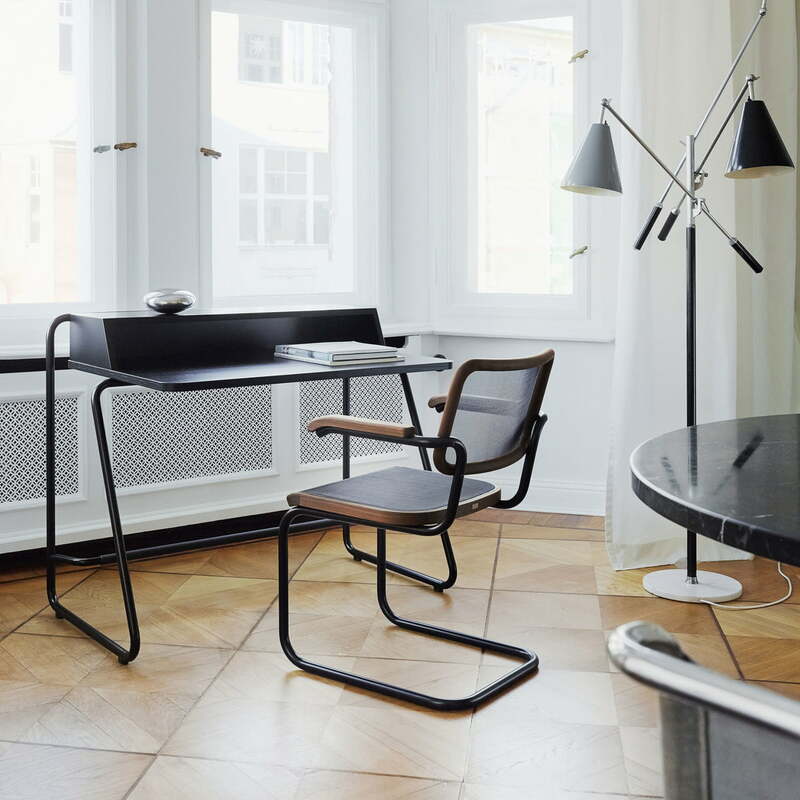 The secretary desk by Randolf Schott for Thonet has been specially designed to use in your own home office. Lifestyle product image of the S 1200 secretary desk by Thonet: The S 1200 is a modern desk, that is compact in size making it ideal for even the smallest of spaces. 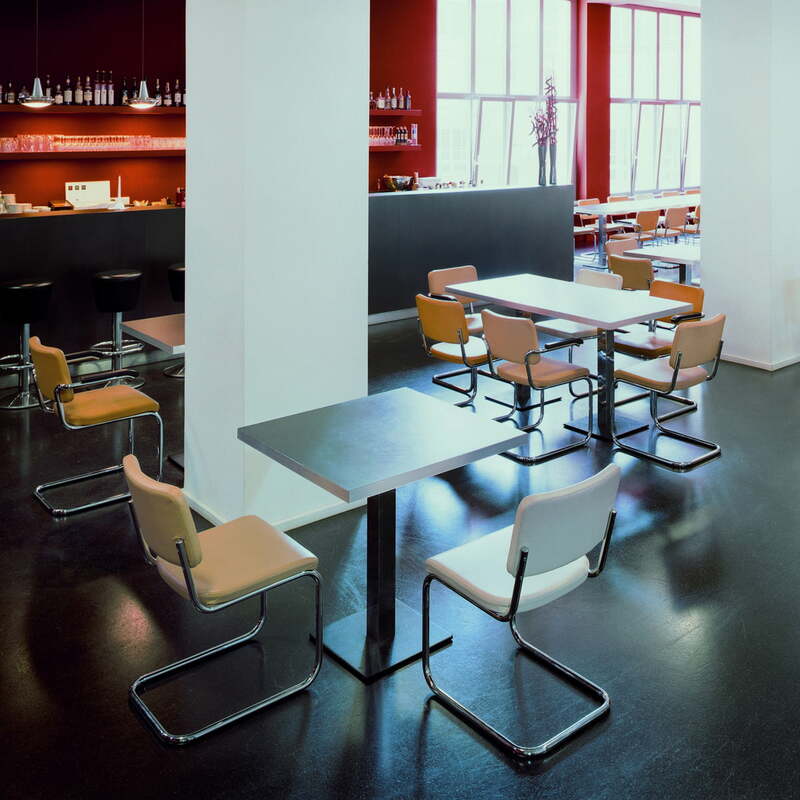 Lifestyle product image of the S 32 chairs by Marcel Breuer for Thonet: The S 32 PV version of the Thonet chair features a padded backrest and seat available in different colours. 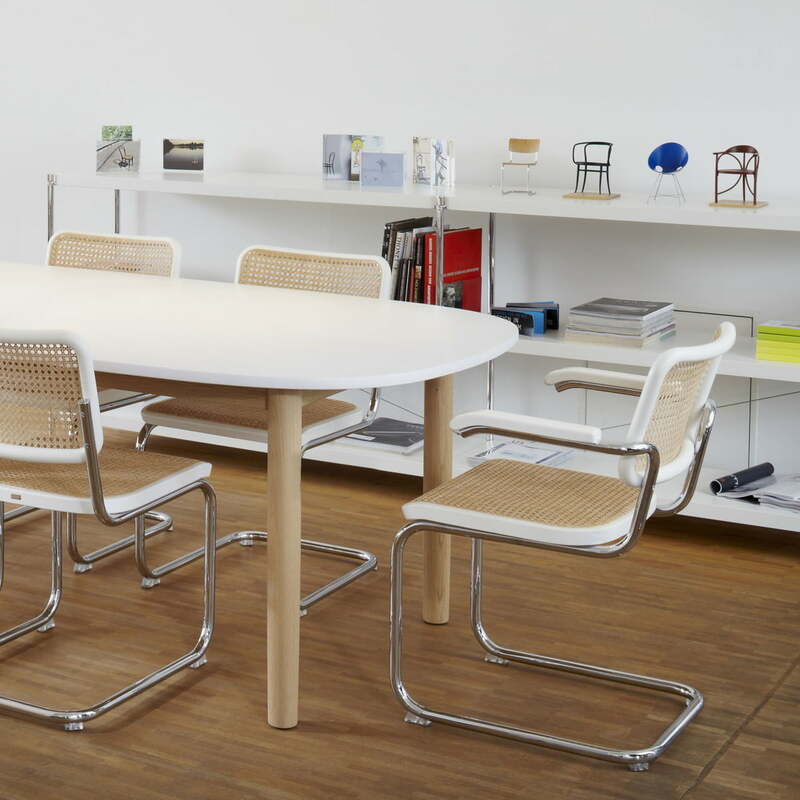 Lifestyle product image of the S 32 chairs by Marcel Breuer for Thonet: The S32 is easily integrated into public and private spaces thanks to its aesthetic minimalism and clarity. The S 32 and S 64 Thonet Chair with mesh fabric: The translucent fabric chairs gives the chair a contemporary touch that make it look modern and fresh.